Yes, I am watching Grease in the background. I guess that means I am listening to Grease. Anyway, I hope that song is now stuck in YOUR head for awhile like I have! This is a bit of a "semi-homemade" pizza. Let me be honest, I do this from time to time and I go through spurts of it. In the summer I tend to do it more, simply because of being busy and not wanting to heat up the kitchen. But I have my own opinions, I think even though you purchase some ingredients, it is homemade, it is assembled by your hands in your kitchen with your love, and dang it, that is homemade. Am I right here? This is probably the first time in maybe 5 or 6 years, (dead serious) that I BOUGHT a pizza crust thingy. I have to much going on and my sister requested that I made a pizza like this for her last winter. WHAT? So she had to be put on my waiting list, I think 6 months out isn't bad at all! Let me just tell you friend O' mine who want to make your own sauerkraut, pizza dough, and Russian dressing on a 100 degree day......GO FOR IT. Isn't happening for me. Also if I had real corned beef on hand, I would have gone that route. But this is a quick and easy pizza, so just do it! This will beyond satisfy any Reuben lover in your life. It far exceeded my expectation but I don't know why, it is just like I made a regular Reuben sandwich just in thin crust pizza form! Some of the toppings, are kind of "to taste" but I will just tell you what I used. Oh yea, ask me why there is only 1 photo of my prep. Because I forgot to take more. And frankly, it's a pizza, you will figure it out! Press dough out unto a pizza pan. Mine is pretty large. Use a cookie sheet if you need to, just get it pressed out. Follow package directions, I needed to pre bake mine for 5 minutes. I let it cool a couple of minutes and then started the masterpiece! Thousand Island dressing, leave a little border. And that is where your pictorial stops! Next comes half of the cheese! THEN the sauerkraut, corned beef on top of that, then the rest of the cheese. Make sure that sauerkraut is drained REALLY well. Bake for an additional 7-10 minutes. Your crust will be golden and the cheese will be melty goodness. This is fantastic and if you aren't sure, just ask me. I will tell you to just make it, and see for yourself! 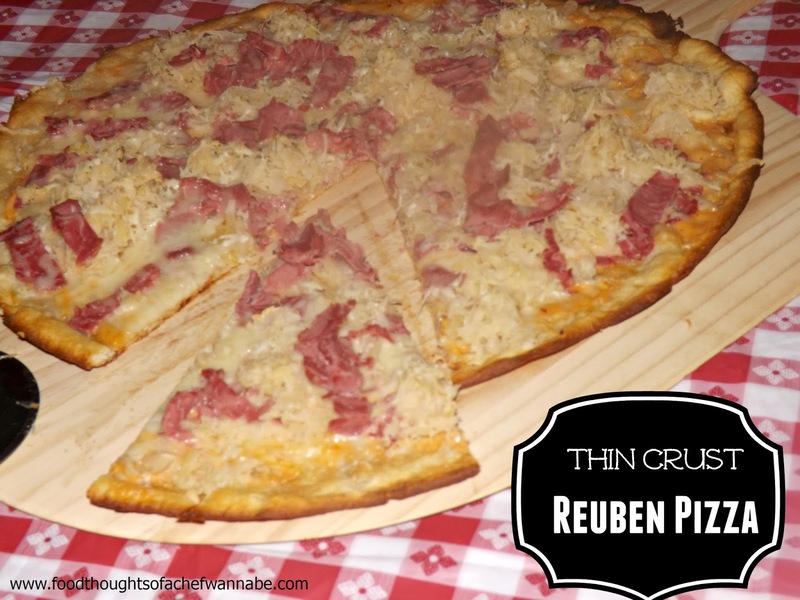 That thin crispy crust and those Reuben toppings, good Lord above, it is amazing!